Cyanotype photogram. 96″ x 51″. 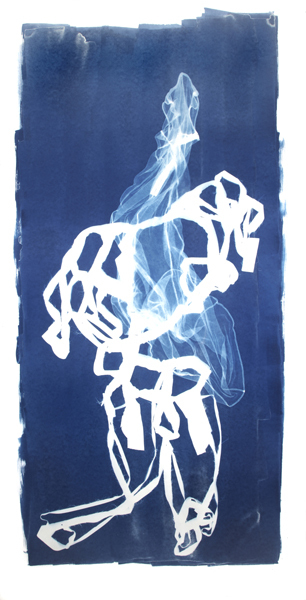 The Blue series (2011) consists of ten large-scale cyanotypes using the remnants of a cut suit and transparent dress as a “negative” to make the fossil-like photograms. This series arose from witnessing a friend grapple with the death of a spouse, and imagines the myriad of ways the dead and the living continue to animate each other. I cut the cloth away from the suit leaving only its seams, like a limp skeleton or cage. The dress is made from tissue-like material, largely visible from the density of its seams and fasteners. Part gesture drawing, part primitive x-ray, the Blue series embodies the conundrum of those split by death. The physical touch necessary to make the contact print is registered as a negative image, instantiating the subject’s simultaneous presence, and absence.